You may notice that I've given Cake Of The Week a bit of a face lift. I've had the same design since early 2013, and was getting a bit tired of the format and colour scheme. I am no html wizard so was heavily reliant on the little image editing knowledge I have, combined with Blogger's template customisation. I am still inclined to tweak the layout a bit over the next few weeks, so please give me any feedback in the comments and I will take it into account. Do you like the new layout? Is there anything that could be improved? I would love to know your take, since without interested readers this site would be no more than a glorified recipe book. These Nutella Brownies, if I do say so myself, were delicious. These were loosely based on my Healthy Brownies, but the key difference here is that I used Nutella instead of chocolate. The result is a moist, rich and dense brownie that oozes (not literally) Nutella flavouring. The brownies went down a storm at work, and would be perfect for pretty much any occasion. Let's all take a moment to thank Michele Ferrero, who sadly died this week, for gifting the world with Nutella. My world, and certainly these Nutella Brownies, would have been lacking without his creation. Preheat the oven to 200C/180C and line a brownie/roasting tin with baking parchment. In a saucepan, melt the butter and Nutella together over a medium heat until smooth. Remove from the heat, then beat in the sugar and the eggs until well combined. Fold in the flour and cocoa powder. If they are lumpy, use a sieve to add them to the batter. Pour the batter into the brownie/roasting tin and bake for 20 minutes. Check with a skewer, and remove from the oven when it comes out with brownie on it. If the skewer has batter on it, return the brownie batter to the oven for another 4 minutes. Do not wait until the skewer is clean, because the brownies will be dry and more cake-like. Allow to cool before slicing up. We Should Cocoa is hosted by Katie at Recipe For Perfection this month, and she has chosen brownies as her theme. These Nutella Brownies certainly fit the bill, though I don't think I'm the only one entering to have come up with such a combination! The challenge is overseen by Choclette at Chocolate Log Blog. Love, love, love your layout. I think it's good to always update our blogs and you've done a fab job. More importantly, your brownies look delicious. Love the new layout esepcially the picture of the cakes on top. I've been meaning to update mine for ages but just haven't gotten round to it. Plus i'm not very techie! Also love nutella and these brownies look divine. Thanks for the feedback! I know, blogging really demands that you juggle a lot of skills. Your layout looks lovely, and I love your Nutella Brownies! 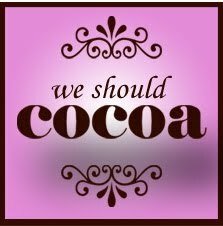 Thanks for joining #WeShouldCocoa! Thanks Choclette, they were really special!